This is a highly collectable Carlton Ware Jam/Compote Dish in their rather scarce Embossed Design. Carlton Ware introduced this product in the 1930s making it one of the more popular designs of the period. 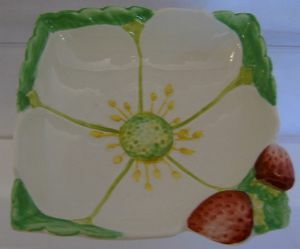 The Square Dish is decorated with a 5-petal strawberry flower with two strawberries on one edge. It measures about 3.5 inches (9 cms) square. There is some very light crazing on the underside. There are no chips nor restoraion work.